A gilded kitchen island is a very special feature in a space that’s glitzy and ritzy. Some modern kitchens are designed to show very little of their function. This one by designer John Minshaw is an excellent example. I’ve taken to thinking of these as “no-kitchen” kitchens because until one looks closely it’s hard to see exactly how things are arranged. Storage is all pantry style with glass doors on the left and full-height slab doors elsewhere so while this isn’t truly minimalistic the working aspects are concealed. The lone stretch of open counter, on the far wall, houses the sink in a niche where a Dornbracht profi faucet is the only conspicuous fixture. And while the gilded kitchen island in the center has a cook top tucked in just across the aisle, the exterior surface has more of a fine antique furniture sensibility than one belonging to most cooks. 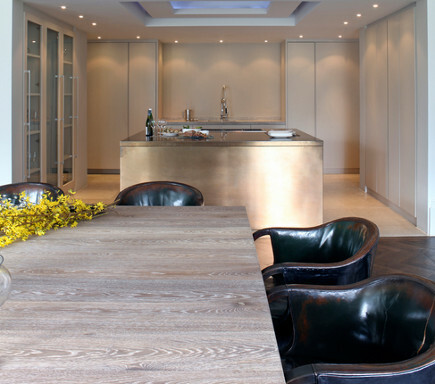 Introducing a gold surface is unusual for a kitchen but this one is not too “Dubai.” It adds a burnished glow that develops a patina and some character with age. It certainly is a softening element when lights are dimmed for dinner at the lovely cerused oak table nearby. And it suggests that not every finish in a kitchen need be strictly utilitarian provided the owner loves it and is willing to live with the fragility as well as the maintenance it might require.